A family favorite, our Cheddar Broccoli Pasta Sides covers broccoli florets with a creamy cheddar cheese sauce. An easy way to bring a meal like our Meatball & Pasta Dinner to life. 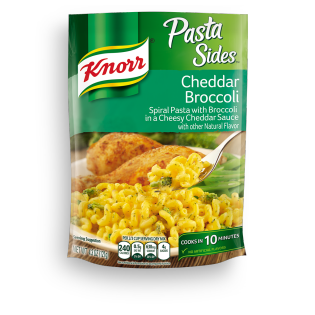 Cheddar Broccoli Pasta is rated 4.5 out of 5 by 166. Rated 3 out of 5 by shaetasstic from I love the flavor and texture of this pasta side when it is cooked correctly. But the process to get to that perfect dish is such a hassle. As a college student, the only way I have to cook this is in a microwave (yes you can do that, there are instructions for it on the bag). I have found that this method, however, is very inconsistent. Sometimes I will follow the directions as far as measurements go and end up with something right. But the majority of the time, it comes out too watery or too dry, even when again following the instructions exactly the same. just a little frustrating, but maybe it's just my microwave and not the food.. Rated 1 out of 5 by Mike61 from Cheddar Broccoli Pasta-broccoli is a joke, right? There should not be any mention that this product in any way contains broccoli at all. I have tried this product three (3) times and other than about 3-small leaves there is no other product green in this item let alone it be broccoli. My last time to try this product as it in no way represents anything to do with broccoli at all. I just made it for lunch today, January 21, 2015 and from the photos below you will see NO evidence of broccoli other than the smallest twinge of color mixed in the otherwise plain mac & cheese.